Today we continue to review some basic but necessary trail tips for successfully walking the narrow path with Jesus. 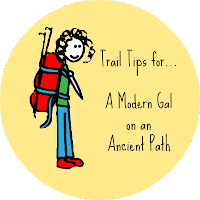 Remember, just like packing the right supplies and exercising the right muscles before a back packing trip, these are simply spiritual disciplines that help us navigate the path wisely, handle the stress of the trail, and enjoy the walk. 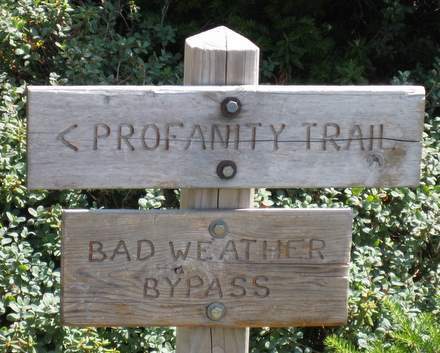 They don't, however, "get us on the trail." Only a saving faith in Jesus Christ as our Lord and Savior paves the way through the narrow gate that leads to this adventure. But if you've entered through that narrow gate, these disciplines will help you stay in the center of the path, where joy and delight abound. I have found consistently and repeatedly meditating on truth throughout my day to be the greatest life-changer I've ever experienced (besides choosing to follow Jesus to begin with, of course). I tend to be a woman who is easily led by emotion. You too? Whether I'm lonely or tired or angry or hurt or sad, those emotions can lead me down some nasty detours. But when I meditate on truth, God's Word, throughout my day, I am able to override those emotions and stay on course. Actually, I'm able to even steer clear of the emotions that might would lead me to divergent paths to begin with. The Bible tells us that when we are satisfied with God's provision of daily bread, we are less prone to seek after things that would get us off course. We are able to live lives that honor and glorify Him, and our passions do not lead us astray. any bitter thing is sweet. Have you ever veered off course because you were so enticed by something that seemed like it would satisfy? I have...many times. But when I learned that only God could truly satisfy my hungers for things like love, purpose, significance, and security, I began to recognize those allurements for what they were...decoys to get me off course. But how does God feed our hungry souls? Through His Word. When we eat a steady diet of God's Word by meditating on it (chewing on it), He satisfies our hungers with truth. Think about it. Aren't you drawn to passages in the Bible that speak of His love for you, His purpose for you, His protection of you, and the significance He gives to you? That's because those truths satisfy your hungers for those very things (love, purpose, security, and significance) like nothing else can! So how do you go about eating His Word so that it satisfies? Purchase or make a meditation/memorization album in which you can build a "menu" of soul-satisfying scriptures...ones that speak to your greatest hungers. I use a simple 4x6 photo album filled with 4x6 index cards as seen below. Then, as God brings scriptures to my attention, I fill the album (slowly) with Bible verses that speak to my soul's current hungers. Build your menu slowly. There's no rush to fill your album with Bible verses. Let God lead you to them during the Sunday sermon, through a message on the radio, during your personal quiet time, in your Bible study. Tell Him what you are craving: security, love, significance, purpose, or even joy, peace, rest, adventure, companionship,etc. Allow Him to supply you with the truths that will feed those hungers best. "Eat" three meals a day. 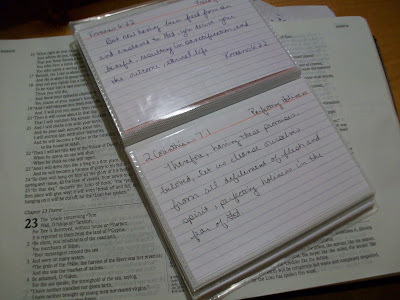 Commit to reading over and thinking on your chosen scriptures three different times during the day. I meditate on mine first thing in the morning, at lunch time, in the mid afternoon, and even as I go to bed. Memorize your scriptures. Memorization sometimes frightens people; but you'll find that if you read over and meditate on your scriptures 3-4 times a day, you'll soon have them memorized. The benefit? When you're away from your album and those nasty emotions start luring you off course...you'll be able to "eat" the truth, be satisfied, and resist the temptation. Make this a lifelong habit. This is no quick fix or temporary cure for what ails you. God's Word tells us to meditate on His truth day and night, consistently, forever. And that, dear one, is a life-changing trail tip to keep you in the center of God's chosen path for you. Now, taste and see! If you'd like to learn more about how God alone can satisfy your hungry soul, I encourage you to check out my Bible study Satisfied...at Last! Many women have found out through this simple study just how life-changing scripture meditation can be. But the study also helps you identify "dry empty cisterns" from which you have been trying to find satisfaction. You can purchase the book here using PayPal or through other online bookstores.